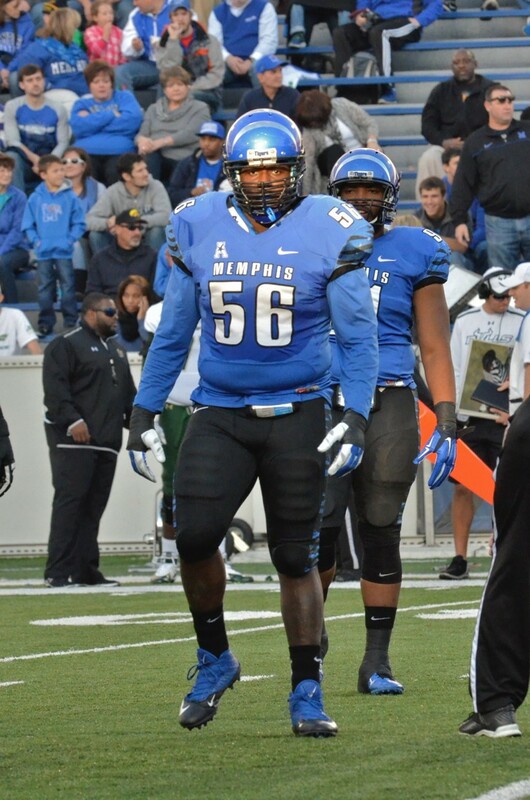 I loved Nick King the first time I saw him in a Memphis Tiger uniform. Less than six months after being named a Parade All-American at East High School, King came off the bench and scored 13 points in 15 minutes in the Tigers' 2013-14 season-opening win over Austin Peay. Five days later, King was the lone bright spot in a flogging the Tigers took at Oklahoma State: 23 points in 15 minutes (eight of 12 from the field). I saw another King — Hall of Famer Bernard — in the way Nick King found ways to score from multiple locations, in traffic, near the rim. King would carry the homegrown torch at the U of M, one proudly held before by Larry Finch, Andre Turner, Elliot Perry, Penny Hardaway, and so many others. After averaging 4.9 points and 3.3 rebounds as a freshman, King's numbers improved to 7.2 and 4.8 this past season, though his field-goal percentage plummeted from 52 percent to 40. He was hampered by an ankle injury that lingered, costing him four games and countless minutes of full health on the floor. King has never been a lock-down defender, and the weakened ankle didn't help his mobility on either end of the floor. He started only seven games and averaged fewer than 19 minutes in the 24 games in which he played. King's transfer will increase turbulence for Tiger coach Josh Pastner, one more case of a coach bringing "elite talent" to campus . . . and losing his grip prematurely. (King and Adonis Thomas would be interesting panelists in this discussion.) King seemed to be given every chance to assume a leadership role this winter. Along with Austin Nichols and Shaq Goodwin, King appeared on promotional posters and the cover of the team's media guide, a premium spotlight for a college player who entered the season without a single start. King started the first five games of the season, but alarms went off when he failed to score in 25 minutes against Stephen F. Austin (a Tiger loss) on December 2nd. How long would it take for King to impact games — positively — for the Tigers? As Pastner moved (again) to a more guard-centric starting lineup, King found himself on the bench. I actually thought King and Kuran Iverson could give the Tigers the best reserve unit in the American Athletic Conference. What a silly notion that seems now. King and Powell will have to sit out the 2015-16 season, and they cannot transfer to another AAC school. King may or may not be missed by Tiger fans, as the incoming Lawson brothers will surely absorb the void in minutes left behind. You get the feeling King's departure will be linked to Pastner's story, whether the coach regains his footing and leads the Tigers back to the NCAA tournament, or leaves (for Arizona State?) before yet another talented recruit proves to be an uncomfortable fit on his roster. I still think Nick King will light up a college scoreboard. It'll be interesting to see which colors he's wearing when he does so. When you look back at the 1999-2000 Memphis Tigers — the last team to miss both the NCAA and NIT tournaments — it’s striking to consider the talent interim coach Johnny Jones had at his disposal. Three starters for that team — Marcus Moody, Kelly Wise, and Earl Barron — are in the program’s 1,000-point club. Wise and Barron were central figures in the first two seasons with John Calipari at the helm (seasons that ended in the NIT, but at Madison Square Garden, and with the championship trophy in 2002). Barron is currently a member of the Phoenix Suns, for crying out loud. Yet 1999-2000 — in this part of the college basketball universe — was just one of those years, the Tigers finishing 15-16, a fan base wondering if Larry Finch took a program’s magic with him when he was fired three years earlier. Many Tiger fans will look back to November 12, 2014, and call it the date this season died, when the University of Memphis took the floor for an exhibition game with Christian Brothers University . . . and lost. Sure, Memphis coach Josh Pastner was experimenting with an unfamiliar roster. And sure, the Buccaneers have nothing to lose and a city’s attention to gain whenever they take the floor at FedExForum. This was a lightning strike bound to happen some November. Just happened to be the one when most Memphians got their first look at Kedren Johnson, Trahson Burrell, and Calvin Godfrey. There’s stumbling out of the gate, and then there’s going belly up before ever entering the gate. This team had its moments. Sweeping the defending national champions for a second straight season — find me another team to have accomplished this — will be the closest thing to a “legacy” the 2014-15 Tigers can claim. But those were two of only three wins (in 15 games) against teams with an RPI among the nation’s top 100. These Tigers never found a competitive punch, not one strong enough to threaten an NCAA tournament team. Not one strong enough, it turns out, to impress the NIT selection committee. Better days are ahead, surely. 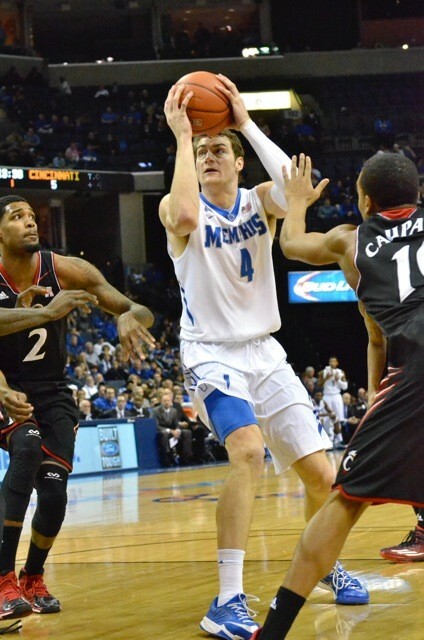 There are more than 300 Division I programs that would relish having Austin Nichols as its centerpiece for the 2015-16 season. (This presumes the all-AAC forward returns for his junior season.) There are more than 300 Division I programs that would relish a McDonald’s All-American among its incoming freshman class, as the Tigers have in Dedric Lawson. Imagine Shaq Goodwin playing an entire season with the fire that helped him grab 23 rebounds in the Tigers’ first game against Temple. Imagine Johnson being in, you know, basketball condition. A long offseason awaits, the program’s longest in 15 years. There is a faction of Tiger fans who believe Pastner is very much a part of the problem, that the still-young coach is unable to match tactics with elite counterparts, that he cannot develop players into a cohesive, threatening unit. If you measure Pastner’s value solely on the past winter, that faction would be correct. 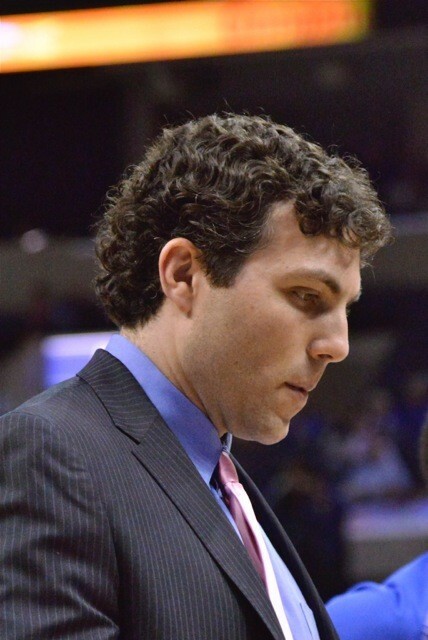 Signed through the 2016-17 season, Pastner is likely to be back, and he’ll be answering questions about this long, cold winter on the hottest days in August. There really is no offseason with this program, is there? “You can get us now,” said Pastner after the Tigers’ final home game last month, “but with our nucleus, and what we have coming in, the future’s extremely bright.” What’s a missed postseason every 15 years? • On March 8th, Shawne Williams became the eighth former Tiger to play in 300 NBA games. Conference USA’s Freshman of the Year in 2006, Williams is now suiting up with the Detroit Pistons, his seventh pro team since being chosen by the Indiana Pacers with the 17th pick of the 2006 draft. Among the eight Tigers with 300 NBA games under their belts, only two played as many as three seasons of college ball: Elliot Perry (4) and Vincent Askew (3). The others (and the number of seasons they were Tigers): Larry Kenon (1), Penny Hardaway (2), Lorenzen Wright (2), Derrick Rose (1), and Tyreke Evans (1). Rodney Carney played in 299 NBA games and Chris Douglas-Roberts has played in 222, though none since January when the Boston Celtics waived him. But the conclusion of a regular season provides the frame for a few memories that will stick for posterity. Here are five from the season just past that should linger. We entered the season knowing the Tiger backcourt would be . . . interesting. Having lost four senior guards, the roster was infused with new ball-handlers, one with no Division I experience (Pookie Powell), one with SEC experience at Vanderbilt, but an entire season of meals ago (Kedren Johnson). And man, did it show. The Tigers played their first seven games without a player accumulating as many as five assists. With Johnson struggling to play himself into game shape, Powell seemed to take over the duty in mid-December, averaging 6.5 assists over a six-game stretch (five of them wins). But then the sophomore's minutes gradually disappeared. Starting with the Cincinnati game on January 15th (in which he played 34 minutes), Johnson assumed the gig. His play has been up and down since. While Johnson will never be mistaken for, say, Joe Jackson, he played a major role in the team's win over the Bearcats and both victories against UConn. Makes you wonder what kind of impact he might make as a senior after a summer of conditioning. • Last word via Twitter. Based on his high-school credentials and physical tools, Kuran Iverson should have been at least a game-altering sixth man for this team. Instead, Iverson's Tiger legacy resides in the dust bin of castaways who prove big-name recruits aren't always the fit coaches — or fans — would like them to be. (Remember Deuce Ford?) Iverson missed the season's first five games with concussion symptoms, then became part of an early-season rotation scramble that only muddied the team's identity further. Then shortly after the new year arrived, Iverson retweeted some derogatory remarks about Josh Pastner, related to disciplinary action taken by the Tiger coach. He might as well have crafted an obituary for his Memphis basketball career. You'll next see the Hartford native wearing the uniform of the University of Rhode Island. What might have been . . . .
You had to wonder which player would emerge as this team's alpha dog. Entering the season, there were really just three candidates, the only players with any experience as Tigers: Shaq Goodwin, Nick King, and the 2013-14 American Athletic Conference Rookie of the Year, Austin Nichols. There is no more wondering, no more debate. As impressive as the Briarcrest produce may have been as a freshman (9.3 points and 4.3 rebounds per game), that season can now be viewed as a tease. Maybe it was Nichols's eight-block night against Oral Roberts five days before Christmas. Maybe it was his 28 points in 35 minutes in the loss(!) to Tulane in early January. Perhaps it's the three games the Tigers almost surely would have won had Nichols not (twice) injured his right ankle: losses to Temple (at FedExForum), East Carolina on the road, and Tulsa (at FEF). Even limited to 27 games, Nichols has blocked 93 shots, a single-season total topped by only three Tigers: David Vaughn, Keith Lee (twice), and D.J. Stephens. Presuming he returns for his junior season, Nichols could become the program's fourth first-team All-America. The 2013-14 Tigers went 24-7 against teams not named Connecticut. (Of course, that team also went 24-7 against opponents not destined to win the national championship.) The Huskies thoroughly declawed the Tigers on their home floor in the quarterfinals of the 2014 AAC tourney at FedExForum. Which made this season's sweep of the reigning national champs the shiniest moments of an all-too-cloudy campaign. The first win (February 19th at FEF) required the lockdown of Husky star Ryan Boatright and 38 minutes from each of three starters (Nichols, Johnson, and Markel Crawford). The second (March 5th in Storrs) required 22 points from Trahson Burrell and a bouncing, deflecting, finally-dropping shot by Shaq Goodwin with eight seconds left and Nichols home in Memphis nursing that ankle injury. These were big wins, even with UConn a shadow of its 2014 edition. The U of M desperately needs a blood-boiling conference rivalry. Based on the intensity we saw last Thursday night, we may have found it. I've touched on this, so pardon any redundancy, but it's an important factor in this program's continued relevance. The Tigers played the same number of games this season at FedExForum as they did in 2013-14 (18). Last season they sold 290,183 tickets, or an average of 16,121 per game. This season: 250,478 tickets for an average of 13,915. That's a drop of 14 percent in attendance and nearly 40,000 fewer tickets sold to see Markel Crawford this winter than were sold to see Chris Crawford last winter. Not since the 2006-07 season had the Tigers averaged fewer than 16,000 tickets sold per game, to say nothing of less than 15,000, or 14,000. The problem? This is not an exciting team. That does not mean they aren't worthy of support. I'd argue this team has some fight in it — dare we call it "grit"? — that some of its recent predecessors did not. But it simply has not energized a prodigious fan base. I heard the word "boring" more often this season than I have since Rip Scherer's offense took the field at the Liberty Bowl. As brilliant as Nichols may be in the post, the jury's out on whether or not he can sell tickets. The team's best long-range shooter — Avery Woodson — would surely come off the bench for a Final Four contender. Perhaps this season was an anomaly, and the arrival of the Lawson brothers for 2015-16 will spark a quick revival. But the U of M has a ticket-selling campaign unlike many it's ever coordinated: "We want you back." What Did We Expect From These Memphis Tigers? Every team, regardless of the sport, lands in one of three areas at the end of its season. The team exceeds expectations, it manages to meet expectations, or it falls short of expectations. But how are expectations defined for a team “starting from ground zero,” as Tiger coach Josh Pastner described his 2014-15 squad last fall? Does the metaphorical bar move up (or down) once the games begin? Wherever the expectations bar is finally set, how realistic is its placement if more than half a team’s players are rookies? As the Tigers’ winter slog continues, connecting the dots between this team’s expectations and actual performance, instead of getting clearer, has grown fuzzier with each dispiriting loss. When Austin Nichols crashed to the floor with an ankle injury against Temple on February 7th, that bar of expectations dropped a notch or two further, leaving the Tigers with an uphill climb toward a reasonable seed . . . in the NIT. • Nichols has exceeded expectations, and by some distance. Before his injury, Nichols had become the Tigers’ primary threat offensively (13.3 ppg) and a shot-blocking force in contention for American Athletic Conference Defensive Player of the Year. Every time the sophomore connects on a midrange jumper, his draft stock rises. If he sticks around two more seasons, Nichols could become the fourth Tiger to earn first-team AP All-America honors. • Shaq Goodwin’s game has picked up the last two weeks, but the season has been a disappointment for a junior named all-conference in the preseason. Expectations were for Goodwin to improve on his sophomore numbers (11.5 points and 6.5 rebounds per game) while serving as Nichols’s partner in the paint at either end of the floor. He’s been the Tigers’ second best player — and has looked like his more-famous namesake the last four games — but that says more about the rest of the roster than it does the former McDonald’s All-American. • Nick King has labored through various injuries (ankle, groin), started a few games, sat out others entirely. Again, if expectations are for a veteran to improve on his previous season, King has fallen short. He shows flashes of being a versatile scorer when the Tigers have the ball. But a difference-maker? Not yet. Then there’s the rest of Pastner’s rotation: Avery Woodson, Markel Crawford, Kedren Johnson, Trahson Burrell, Calvin Godfrey, Pookie Powell. What were their expectations? What were Pastner’s expectations for them? (Considering the season’s downward spiral, the coach’s view would presumably be “fall short” for all six.) Twenty-five games into the season, I’m still not sure how to grade a player like Johnson. Fans — and analysts — have clamored for the Vanderbilt point guard who played a starring role two (long) years ago in Nashville. So Johnson has fallen well short of those expectations. The others? The Tigers may in fact have the Woodson, Burrell, and Crawford “as advertised.” As supporting players, they’re good enough to go 15-10, but no better. 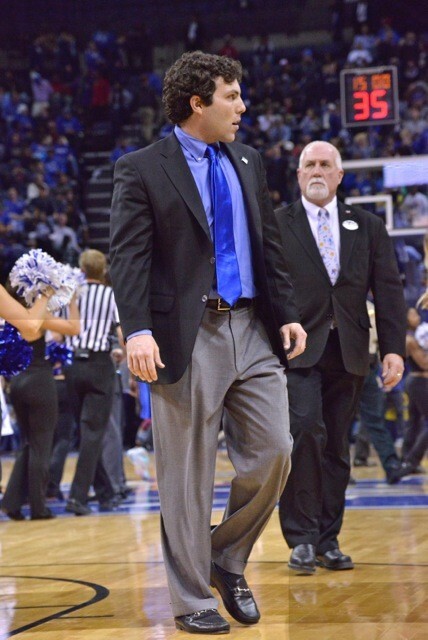 If Connecticut blows out the home team Thursday night at FedExForum, Pastner’s seat on the Tiger bench will become positively flammable. You have to wonder about the thoughts of first-year assistant coach Keelon Lawson, as he sits a few seats to Pastner’s left for this season of discontent. Two of Lawson’s children, of course, are expected to be next season’s answers to the Tigers’ problems. Can K.J. and especially Dedric Lawson take the floor next November and make the winter of 2014-15 a distant memory? Can two siblings — each a top-50 recruit — sell thousands of tickets to FedExForum that went unsold this season? If you think Pastner’s seat is hot, consider that of a colleague and father . . . with the stakes higher for this program than any since John Calipari arrived 15 years ago. Let’s remember the Tigers are 0-0 in American Athletic Conference Play. There’s plenty to gain this season. Here are five steps that might be considered to regain the Tigers’ footing on the hardwood. 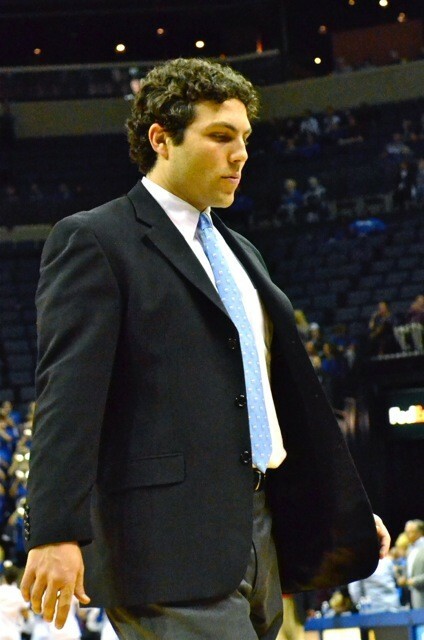 Tiger coach Josh Pastner made 23 substitutions in the first half of last Saturday’s win over Bradley, and this was during a half his team outscored its opponent by 14 points. Eight players ran the floor for at least eight minutes, but only one (Avery Woodson) for more than 12. A short leash strangles the life of a basketball player. As the Tigers struggle to find their collective identity as a team, Pastner is making the process harder by changing his lineup, it seems, by the minute. If a message needs to be delivered, pull the player, deliver the message, and send him right back in. The opposite — sending a player in and pulling him after his first mistake — is actually harming the player’s development. It’s human nature: When something goes wrong, make a change. But particularly with the few nonconference games left for experimentation, Pastner should consider committing to a rotation (seven or eight players) and seeing if that group can play winning basketball. Change is going to happen with this raw team, but let it be game-to-game, not minute-to-minute. • Start Trahson Burrell and bring Nick King off the bench. Burrell seems to be the closest this team has to a natural scorer, someone who can put points on the board from inside or outside, with open looks or in traffic. The 6’6” swingman has shot 54 percent from the field and reached double figures (off the bench) three times. His size should help with perimeter defense (more on that later), and he has an “energy” intangible sorely lacking with some members of this roster. As for King, I’m convinced he’d thrive in attacking an opponent’s second unit, the best “junk” scorer the Tigers have. Witness the nine points he scored in ten first-half minutes (off the bench) against Bradley. And King seems to clog an offense steered toward Austin Nichols and Shaq Goodwin. The Tigers may gain by not having the three on the floor together. Pastner started a three-guard lineup in the Bradley win. I’d advocate two guards, Nichols, Goodwin, and Trahson Burrell. 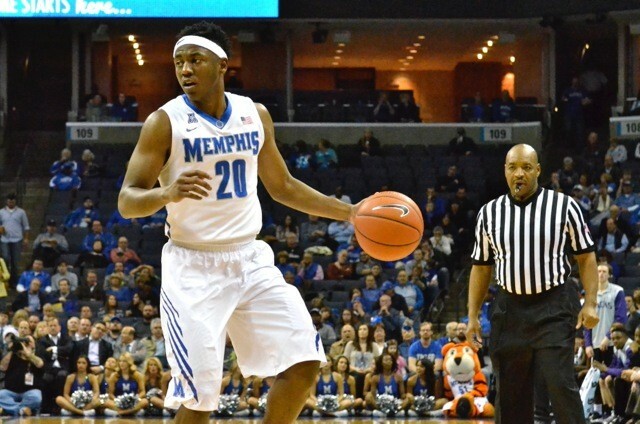 King and Kuran Iverson could give Memphis the best bench in the American Athletic Conference. • Defend the three-point line like it’s a home invasion. In the Tigers’ three wins this season, their opponent has shot less than 30 percent from three-point range. (Wichita State shot a lowly 25 percent in the Shockers’ win on November 18th.) Meanwhile, the only Tiger to show marksmanship from beyond the arc is Woodson. Memphis will rarely have an advantage in this component of a game. The Tigers are not a big team. Making matters worse, their two biggest players — Nichols and Goodwin — play smaller than their size. This is not a team that will defend the rim like the days of Joey Dorsey (or Will Coleman, even). So the Tigers must do all they can to remove the three-point shot from an opponent’s arsenal. Markel Crawford, Woodson, Pookie Powell, Burrell, Kedren Johnson, and Iverson give Pastner the kind of bodies capable — with the right effort — of making the three-point line hostile territory. • Get to the free throw line. 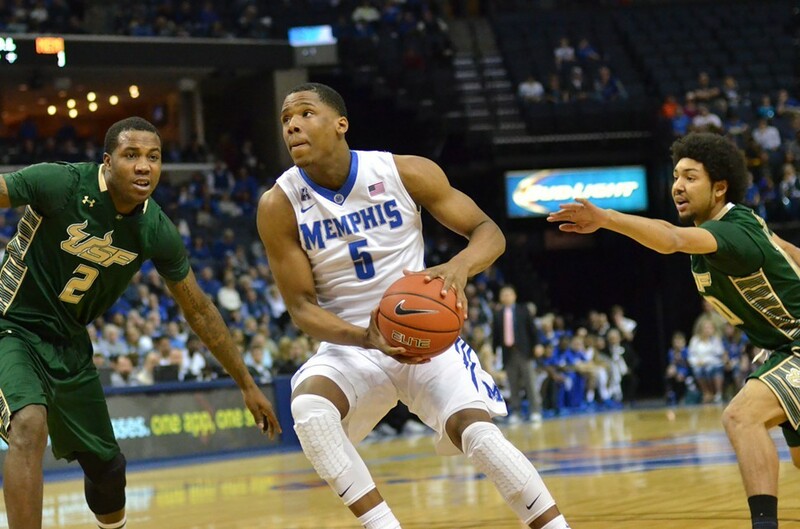 With a propensity for turnovers, the Tigers will have trouble pushing the pace offensively. But players don’t turn the ball over at the free-throw line. Particularly with their long-range shortcomings, the Tigers need to dribble-drive, draw contact, and get to the charity stripe for some free points. Burrell has the finest looking shot on the team. It would be nice to see that sweet backspin frequently as conference play nears. Goodwin and Nichols combined for 21 free throws (though they missed nine) against the Braves. That’s more foul shots than the entire team took in the loss to Stephen F. Austin (16). • Eliminate emotion from the building equation. Yeah, right. This is Memphis. And Tiger basketball. No such thing as a “balanced view” of the team’s chances for a championship (national, that is). The team is great (and underrated nationally) or the team is atrocious (and the coach must be fired). Since he was hired, Pastner has embraced the passion of what he calls “Tiger Nation.” And as the Tigers stumbled out of the gate this season, he’s repeatedly said the fan base “should be angry.” Why? Because he — or the team — owes that fan base a winning team? That’s absurd. The Tiger basketball program owes its fan base one thing: effort. That goes for the coach (and his assistants) and the players. This year’s club is an ongoing project, as any sentient observer would have forecast after counting the number of returning guards. Pastner has to use every game as a sharpening tool for the project. Trim fat. Cut waste. Slice away indifferent play at the first sign. What Pastner must do — unlike last season — is build a team. What fans see in November is rarely what they see in late February or March. So forget anger, frustration, and bitterness. Emotion is distraction from the mission at hand. Build a team. As far as three-year rebuilding plans go, we have a new standard. In December 2011, Justin Fuente was given the keys to a rusty, oil-burning pile of scrap with (maybe) one partially inflated tire. Today — three regular seasons later — Fuente is behind the wheel of a machine Matthew McConaughey would be pleased to drive. The 9-3 Memphis Tigers — read that record again — will play in a bowl game, to be announced this Sunday. They’ll take the field for that postseason tilt — the program’s first in six years — riding a six-game winning streak, something not seen in these parts since 1969. For a long-suffering Memphis football fan base, the wait (’til this year) is over. Ironically, the first signs of legitimate progress for the Tiger program were the team’s first two losses of the season. Memphis traded punches with 11th-ranked UCLA on September 6th, tying the game at 35 early in the fourth quarter when senior safety Fritz Etienne returned an interception for a touchdown. Three weeks later in Oxford, the Tigers trailed 10th-ranked Ole Miss, 7-3, entering the fourth quarter. Coming up short in these two games seemed merely to fuel the motivational fire, particularly for a defense that — led by defensive coordinator Barry Odom and eight senior starters — climbed its way to elite status, surrendering only 17.1 points per game. The last Memphis team to win nine games (2003) featured the greatest player in Tiger history (DeAngelo Williams) and, not incidentally, the program’s most accomplished quarterback (Danny Wimprine). According to Fuente, this year’s team lacks a definitive headliner: “There’s no superstar on either side of the ball. This group is selfless, and they’re good listeners. That’s an important trait.” The lack of a season-long headliner didn’t mean the 2014 Tigers were starless. They just shared the spotlight, one week to the next. • Paxton Lynch passed for 305 yards and a touchdown, while rushing for another score in the loss at UCLA, enough to earn him American Athletic Conference Player of the Week honors. He hasn't thrown an interception in six games. 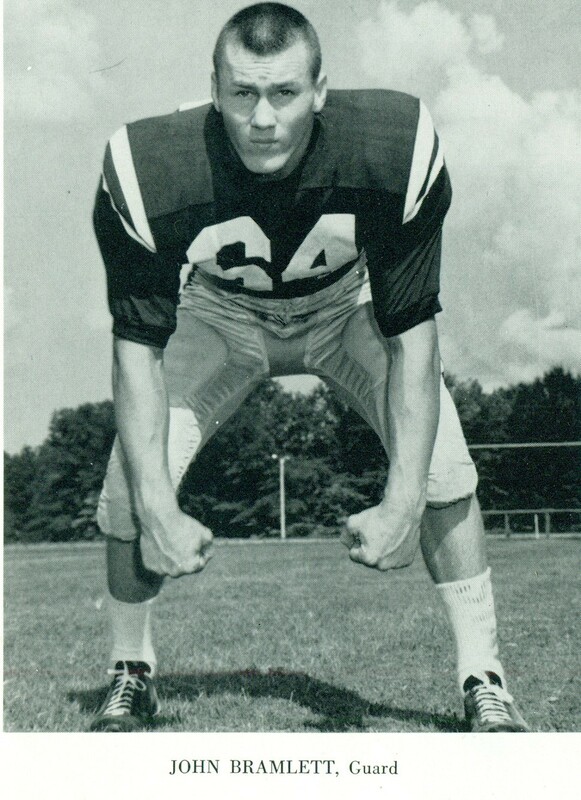 • Tank Jakes had a game (against Middle Tennessee) that would have made Jack Lambert proud: two sacks (one for a safety), a forced fumble (that led to a Bobby McCain touchdown), and an interception. • Sophomore kicker Jake Elliott split the uprights as time expired at Temple on November 7th, culminating a 66-yard drive over the game’s final 2:40 to clinch bowl eligibility for the Tigers. • After injuries sidelined running backs Doroland Dorceus and Sam Craft, senior Brandon Hayes took over, rushing for 199 yards against Tulsa and 189 against USF. Once a walk-on, the White Station alum personifies his team’s rise from irrelevance to conference champions for the first time in 43 years. What’s the difference in the culture of Tiger football today and that of 2011, Larry Porter’s last as head coach? Best to ask a four-year senior who has experienced both. “Maturity,” says defensive end Martin Ifedi, now the Tigers’ alltime sacks leader. “We have great coaches who came in and showed us the vision. We implemented the plan in the offseason, and were consistent [with our work]. [Coach Fuente] doesn’t tolerate certain things. We understand what he wants. We play hard on the field for each other." You’ll hear the Tigers caught a break by not having East Carolina or UCF (both AAC heavy hitters) on the schedule. But there’s a corollary: The Pirates and Knights each caught a break by not having Memphis on their schedule. The first test of any champion is beating the teams you’re supposed to beat. The Tigers were undefeated in such games this fall, and added tough wins at Cincinnati and Temple to their ledger. With nine wins, they are already in the Memphis history books (only five Tiger teams have won as many). Should they win their bowl game, the 2014 Tigers will join the 1938 team (10-0) as the only 10-win clubs in the program’s history. Worry about the newly popular Fuente’s future after that bowl game. For now, relish a singular football team with an engine humming on all cylinders. The University of Memphis will conduct its annual Senior Day ceremony this Saturday before the Tigers kick off against Connecticut. Unlike the previous five such ceremonies, this one will not mark the final college game for the honorees. All 21 seniors will be in uniform for a bowl game and, with a win against the Huskies, would play that bowl game as champions of the American Athletic Conference. A win Saturday would also make this just the sixth Tiger class to win nine games as seniors. • You didn’t see five members of this class on the field all that much, unless you looked carefully at special teams. But they toiled through two-a-days in August, stretched muscles and tendons in the weight room, and devoted themselves to a football cause under coach Justin Fuente. Football’s too brutal a game for “role players.” These young men have earned — with sweat and grit — the ovation they’ll hear Saturday: Sam Billings (DS), Melvin Jones (DE), Larry Lawrence (DT), Kevin McIntyre (OL). • You’ve probably read the Brandon Hayes story a few times now. After starring at White Station High School, Hayes endured a redshirt season and two seasons lost to injury before climbing his way up the depth chart to a starring role at tailback. He leaves the U of M as the eighth player in Tiger history to rush for 2,000 yards in his career. Linebacker Ryan Coleman transferred to Memphis from Idaho State after the 2011 season and has started 17 games over the last two seasons. Safety Fritz Etienne played a season at Coffeyville Community College in Kansas before transferring to Memphis. A reserve in 2013, Etienne has started every game as a senior. Cornerback Andrew Gaines has been one of three senior starters in the Tiger secondary and has three interceptions this season. Nykiren Wellington started 11 games on the offensive line as a junior and has been on the field as a reserve this season. Joe Craig and Adrian Henderson have been part of the deepest core of receivers the Memphis program has enjoyed in years. And linebacker Tank Jakes? Check out his numbers: 58 solo tackles, six sacks, 15 tackles for loss, four forced fumbles, an interception, and a safety. Jakes is a lock for all-conference and will receive votes for the American Athletic Conference Defensive Player of the Year. • Nine Tiger seniors deserve an extended salute for having played in 2011, the dreadful 2-10 season under Larry Porter that resulted in Porter’s dismissal and the hiring of Justin Fuente. They are the only group in Memphis history to win but two games as freshmen and then reach a bowl game as seniors. Linebacker Derek Howard has been a special-teams regular and played in at least 10 games each of his first three seasons, just like defensive lineman Kendrick Golden, who has played in more than 40 games over his career. Right tackle Al Bond will make his 41st career start against the Huskies Saturday. Over one stretch this season, Bond was on the field for 401 consecutive offensive snaps. Mitchell High alum Keiwone Malone transferred from Alabama before the 2011 season and has caught 113 passes over his career, tied for 8th in Tiger history. Bakari Hollier has been a regular in the much-improved Tiger secondary and leads the team this season with eight pass break-ups. Nose tackle Terry Redden — a graduate of Whitehaven High School — has started 28 games as a Tiger and made life miserable for opposing interior linemen. 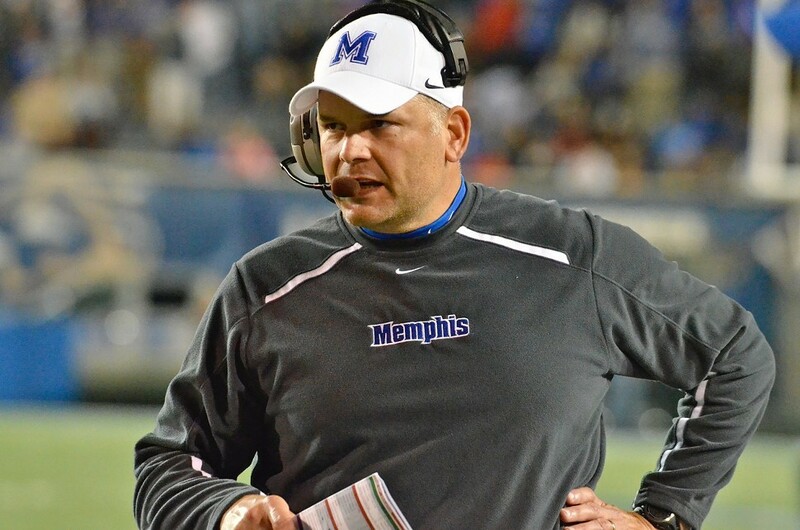 Before the season began, Fuente suggested Redden could be the most valuable member of his defense. Linebacker Charles Harris — another Whitehaven alum — has started every game since his sophomore season and is one of two current Tigers (along with Jakes) with more than 100 solo tackles in his career. Defensive end Martin Ifedi earned first-team all-conference honors as a junior and will leave the program with the most sacks (22.5 through last Saturday) in Memphis history. And finally, cornerback Bobby McCain. The closest thing to an offensive force on the Tiger defense, McCain will make his 42nd career start against UConn. He has 11 career interceptions and returned a fumble 59 yards for a touchdown in the September win over Middle Tennessee. In case you haven’t noticed, this isn’t your big brother’s Memphis football program. The Tiger defense ranks eighth in the country in points allowed (17.5 per game). You’ve heard of the teams in front of them: Ole Miss, Alabama, Wisconsin, Penn State, Marshall, LSU, Stanford. Led by eight senior starters, the Memphis defense encapsulates coach Justin Fuente’s remarkable three-year transition. The 2011 Tigers allowed 35 points per game with some of this year’s seniors on the field as freshmen. Those seniors — and all their teammates — are now making Memphis history when they take the field. Here’s hoping space is limited at the Liberty Bowl Saturday afternoon. • The statistic that continues to jump off the screen for this team is the offense’s performance in the red zone (inside the opponents’ 20-yard line). Memphis has entered scoring territory 43 times this season and come away with points on 40 of those occasions. Only four teams in the country have a higher red-zone percentage and the Tigers actually have a higher touchdown percentage (65 percent) than the top two teams (UCLA and Missouri). Why the remarkable efficiency? Three reasons. The Tigers have the deepest running attack in the American Athletic Conference. Doroland Dorceus and Sam Craft had their star turns before injuries sidelined them. But senior Brandon Hayes, freshman Jarvis Cooper, and last Saturday, freshman Robert Davis, have carried the ball for the most critical yards on the field. Secondly, the Tiger attack continues to be fueled by its best offensive line in years. Among AAC teams, only Cincinnati has allowed fewer than the 14 sacks allowed by Memphis. And finally, sophomore quarterback Paxton Lynch has played like a senior in the red zone. Lynch has thrown but six interceptions in 303 attempts and leads the Tigers with eight rushing touchdowns. • Should two (or three) teams tie atop the American Athletic Conference standings at season’s end, the league will declare co-champions. Which means Memphis is two home wins from its first conference title in 43 years. (The Tigers earned the 1971 Missouri Valley championship by going 3-1 in league play. The team finished that season 5-6, winners of something called the Pasadena Bowl.) Adopting the team’s current philosophy, the Tigers must go 1-0 against South Florida (a team that snuck by winless SMU last Saturday) and then 1-0 against Connecticut (2-7) two days after Thanksgiving. As for the teams currently tied with Memphis with one league loss, Cincinnati (a team the Tigers have beaten) plays at Connecticut, at Temple, and hosts Houston, while UCF (not on the Tiger schedule) hosts SMU, then travels to USF and East Carolina. With only two regular-season games left to play, and both at home, the Tigers have a decided inside track to the AAC championship . . . and any consideration given for a spot in the “New Year’s Six” bowl games. One more reason to rub your eyes in wonder at the fortunes of a long-beleaguered program. • The Tigers are having a good season, but they have the chance to make it historic. Between 1960 and 1963 — the program’s true golden era — the U of M won at least eight games (and lost no more than two) every season. Those were the Tigers of Dave Casinelli, John Bramlett, Harry Schuh, and Russ Vollmer, coached by Spook Murphy. Never before or since have the Tigers even approximated a four-year record of 33-5-1. And since 1964 — a half-century — the Memphis program has a total of four 8-win seasons. 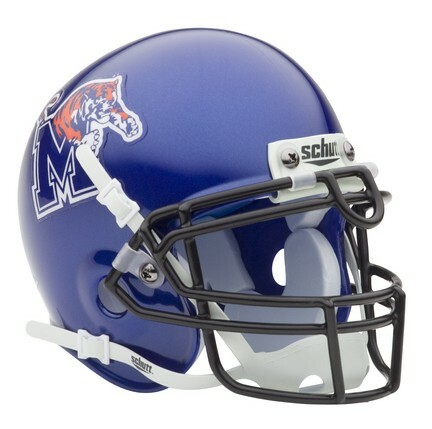 The 1969 Tigers went 8-2, losing only to Ole Miss and Tennessee. In 1973 — Fred Pancoast’s second as coach — Memphis went 8-3. (It should be noted that none of these teams, including those from the early Sixties, played in a bowl game. There weren’t 35 of them way back when.) The 2003 Tigers — led by record-breaking quarterback Danny Wimprine and All-America tailback DeAngelo Williams — went 9-4 (only the fourth 9-win season in program history) and followed up with an 8-4 season in 2004. This year’s team would have to suffer an ugly collapse to fall short of eight wins. The question seems to be whether or not nine (or even 10) enters the record book. • I continue to be amazed by the Tigers’ depth at wide receiver. Eight players caught passes from Paxton Lynch against Temple . . . and Lynch only completed 21. Tailback Brandon Hayes caught two, as did tight end Alan Cross. Then there was Mose Frazier (a whopping eight catches for 110 yards), Keiwone Malone, Adrian Henderson, Tevin Jones, Phil Mayhue, and Roderick Proctor (the last two are freshmen). Somehow senior Joe Craig missed out on the aerial fun (he returned three kickoffs). For the second straight season, Memphis may not have a receiver accumulate 600 yards (Jones leads the team with 374). But the number of talented options at the disposal of Lynch and offensive coordinator Darrell Dickey is an extraordinary luxury. Imagine the pressure to catch any pass thrown your way if you’re a Memphis receiver hungry for playing time. Competition shapes champions, especially when it’s internal. The Tigers have won their last seven games with the Green Wave. Tulane was the only FBS team Memphis beat in 2011, and in New Orleans. Tulane enters Saturday’s game with a nice win (at Houston) on its resume, but with losses to two teams Memphis has beaten (Tulsa and Cincinnati). The Green Wave averages a paltry 19.6 points per game (115th in the country), though they put up 31 against the Cougars last Saturday. The Tigers aim to secure their first in-season four-game winning streak since 2003. Nothing’s automatic in the Big Easy, but it’s always fun. • Go ahead and say it: “November’s here and the University of Memphis football team is tied for first place.” After two rather seismic upsets last Saturday in the American Athletic Conference — Temple over East Carolina and UConn over UCF — five teams find themselves atop the league standings with 3-1 records, including the Memphis Tigers. (Making the loss to Houston on October 11th sting a little extra.) Several dominos must fall precisely for the Tigers to win their first conference title in memory, but how nice to have the conversation, to speculate about a championship — in football! — as the leaves turn red and orange. Late last Friday night — Halloween, remember — Memphis coach Justin Fuente said that, after East Carolina, “there isn’t a nickel’s worth of difference between anyone else” in the American. By the time the Owls finished off the 21st-ranked Pirates the next day, Fuente had some believers. (And Tiger fans had a new reason to fret over this Friday’s tilt in Philadelphia.) 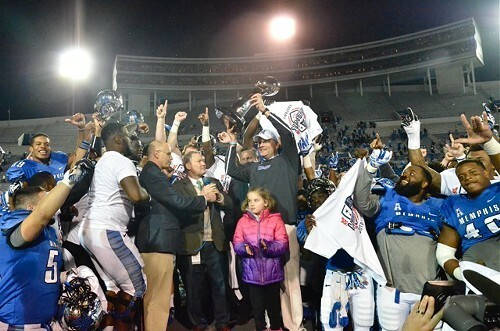 Memphis has a distinct advantage over the season’s final four weeks in that the Tigers do not play ECU or UCF, until last Saturday the American’s standard bearers. (UCF’s loss to the Huskies was the Knights’ first defeat in league play. Ever.) You have to believe that the league champion will be the team — among those 3-1 now — that wins its remaining four games. UCF and ECU play each other. Houston and Cincinnati play each other. That leaves Memphis as the league-leading outlier, tasked with facing three teams already saddled with at least six losses . . . and Temple. Big game this Friday night. Huge. • The story of the season remains the Tiger running game. Memphis rushed for 243 yards against Tulsa, the fifth time this season the U of M has topped 200 yards on the ground, all victories. Brandon Hayes galloped for 197 yards — a career high — and is now within 35 yards of becoming the eighth Tiger running back to gain 2,000 yards for his career. Hayes’s 51-yard jaunt late in the first half against Tulsa gave Memphis the lead in what had become an uncomfortably close game. His 30-yard touchdown with 10 minutes left on the clock clinched the win for the Tigers and the first wining streak (if but two games) of the season. And Saturday night was simply Hayes’s turn in the spotlight. Jarvis Cooper and Sam Craft each had 100-yard efforts before Hayes. And sophomore Doroland Dorceus was on his way before a season-ending injury against Ole Miss in the fourth game of the season. The ball carriers may change, but the offensive line has remained a constant, particularly the four Tigers who have started every game: tackles Al Bond and Taylor Fallin, guard Tyler Uselton, and center Gabe Kuhn. It’s no coincidence that the same team that leads the American in scoring (36.2 points per game) also leads the league in rushing (206.0 yards per game). Memphis and Cincinnati, it should be noted, have allowed the fewest sacks (10) among AAC teams. Particularly with cold weather’s arrival, the strength of an offensive line is a premium component to winning football games. Memphis seems to be in good hands (at least ten of them). • Cold, blustery weather, Friday night, and (maybe) Halloween limited attendance at last week’s game to 26,846. (The lure of national TV trumps any concession to local high school football competition.) But the Tigers’ attendance average after four home games — 33,342 — ranks third in the American, behind only East Carolina (44,755) and UCF (40,156). If the figure holds through the end of the season, it would be the program’s largest attendance average since 2005, when the Liberty Bowl hosted an average of 39,991 for DeAngelo Williams’s final college season. With the Tigers all but certain to secure bowl eligibility (one more win) and possibly competing for a conference championship, the games against USF (November 22nd) and UConn (November 29th) become more and more attractive. The trick, of course, will be convincing local basketball fans that late November is still football season. • The University of Memphis lost a certifiable legend with the passing of John Bramlett last week. “The Bull” starred as a Tiger on both the gridiron and baseball diamond, building a reputation somehow tougher than the nickname he carried his entire adult life. With Bramlett’s death, there are only two living members of an exclusive club of six: Tiger football players to have their jerseys retired. Gone before Bramlett were Charles Greenhill (who died in the 1983 plane crash that killed Memphis coach Rex Dockery), Dave Casinelli (killed in a car wreck in 1987), and Harry Schuh, who died in 2013, two years after his jersey was retired. The U of M program is long overdue for actually displaying the names and numbers of these honored greats at the Liberty Bowl. (There’s a handsome wall display at the practice facility on the south campus, but it’s seen only by members of the program, insiders, and wandering media types.) The city of Memphis owns the Liberty Bowl, but the U of M can display banners on game day as it chooses. The Tigers have rightfully honored six great players, including Pro Football Hall of Fame candidate Isaac Bruce and current Carolina Panther DeAngelo Williams. Let’s see their names and numbers prominently displayed at the stadium their alma mater calls home. • Speaking of retired jerseys, the next Tiger to be honored should be former quarterback Danny Wimprine. The Louisiana native passed for 4,445 more yards than any other Memphis quarterback (10,215), and tossed 81 touchdown passes (second on the list is Martin Hankins with 43). We need to start tracking Paxton Lynch’s numbers relative to Wimprine’s. If Lynch stays healthy and plays four seasons, he’ll be the first Tiger quarterback to threaten Wimprine’s records. Through his sophomore season (2002), Wimprine had thrown for 4,149 yards and 37 touchdowns. Seven games into his sophomore campaign, Lynch’s numbers are 3,764 and 19. • This may be the only time all season you read “American Athletic Conference” and “Power Five” in the same sentence. Because the American is woefully weak at the bottom of the league standings, the polar opposite of anything resembling the likes of the Big Ten, ACC, or, gulp, SEC. You might say, actually, the American includes a “Sour Five,” four of whom play the Memphis Tigers over the next five weeks. (Memphis handled the fifth member of this ignominious group — SMU — last Saturday.) Check out the rankings of the Sour Five in scoring among the 128 FBS teams: 97 (Tulsa, this week’s opponent), 108 (USF), 119 (Tulane), 127 (UConn), and 128 (SMU). At 4-3, Memphis could enjoy its longest stretch of success since winning five of six games to finish the 2007 regular season. (SMU and Tulane were among the victims seven years ago.) Tulsa, it should be noted, is 122nd in points allowed (40.7 per game). Needless to say, a loss to any team not named Temple will leave a sour taste. • The Tigers lead the American Athletic Conference in rushing (195.8 yards per game) despite not having a player ranked higher than ninth individually (Sam Craft, with 50.2 per game). This is partly explained by the injury that ended Doroland Dorceus’s season after just four games (and 237 rushing yards). Senior Brandon Hayes missed a game and has seen carries taken by Craft, but the White Station alum has still averaged 46.2 yards per game. Add freshman Jarvis Cooper (171 yards) and Paxton Lynch (133 yards despite being penalized by sacks on his rushing totals), and the Tigers have what amounts to a four-man band of ball carriers behind a line that continues to create gaps. If you’re looking for a magic number behind Tiger victories this season, start with 200 rushing yards. Memphis is 3-0 when gaining 200 on the ground, and 0-3 when they fall short of the figure. • With the second half of the season upon us, let the campaign officially begin for Tank Jakes as the American’s Defensive Player of the Year. Having already been named Defensive Player of the Week twice, Jakes leads the AAC in sacks (6) and tackles for loss (12, four more than anyone else in the league). And here’s a telling figure: Among Jakes’s 50 total tackles, only 13 have been assisted by teammates. (Cincinnati’s Jeff Luc leads the American with 75 tackles, but 40 of them are the assisted variety.) Among the eight players in the AAC with more total tackles than Jakes, none have fewer than 20 assisted hits. Jakes has been, quite literally, a one-man wrecking machine all over the field for Memphis. Particularly with Martin Ifedi’s extended absence, it’s hard to imagine a defensive player providing more value than Jakes has midway through the 2014 season. • June Jones knew what he was doing when he resigned two games into his seventh season as coach of the SMU Mustangs. This is the worst team in college football, and by some distance. The Mustangs rank dead last among 128 FBS teams in both scoring (6.5 points per game) and points allowed (48.0). The closest game they’ve played is a 45-24 loss to East Carolina on October 4th. The Cincinnati team that Memphis handled earlier this month (41-14) beat SMU last Saturday, 41-3. This Saturday will be the first FBS “gimme” the Tigers have played in quite some time, a game to shake off any rust after a bye week . . . and make sure players return to Memphis healthy for what will be a short week of prep before Tulsa arrives on Halloween night. There’s a compassionate part of me that feels for the program that gave us Don Meredith and Eric Dickerson, a program that only three years ago destroyed the Tigers (42-0) at the Liberty Bowl. On the other hand, this is a team that destroyed the Tigers three years ago at the Liberty Bowl. Time to balance the scales a little. • Five games provide some healthy perspective on the strength of a football team. The Tiger offense isn’t the juggernaut unleashed against Austin Peay in the season opener, though based on last Saturday’s win at Cincinnati (only the fourth time in Memphis history the Tigers have gained 600 yards), the offense may well be a junior-juggernaut. The Bearcats, of course, gave up 700 yards the previous week against Ohio State, so wave these numbers at your discretion. The Tigers struggled mightily at Ole Miss on September 20th, but in light of the Rebels’ upset of Alabama last week, trailing 7-3 in Oxford (in the fourth quarter, no less) may become a calling card for this team. Memphis took hits at Vaught-Hemingway — on both sides of the ball — unlike any they’ll take the rest of the season. As Sam Craft and a band of replacement runners carved up Cincinnati for 299 rushing yards, the Memphis offensive line must have felt like a man or two had been removed from the field for the Bearcat defense. There were gaping holes and time aplenty for Tiger quarterback Paxton Lynch (311 yards). 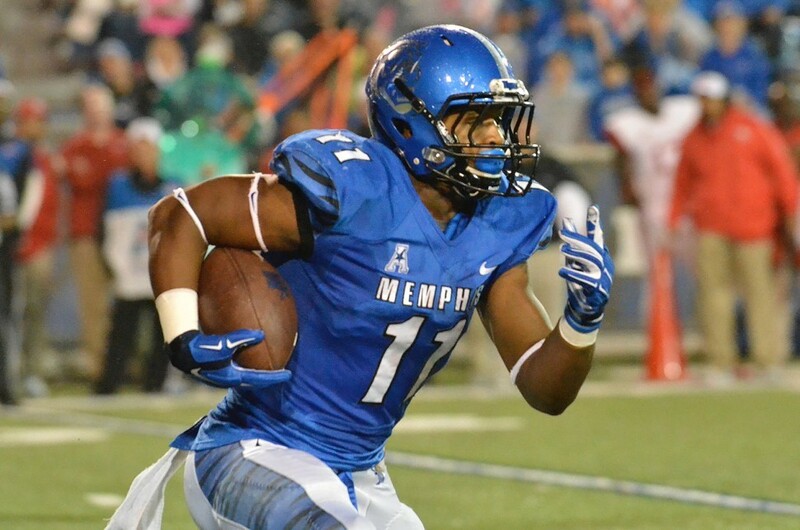 Memphis has rushed for more than 250 yards in three of its five games. They exceeded 200 but once the entire 2013 season. This is very good, folks. • Since the turn of the century, Memphis has won four games before October 15th only three times. In 2000 and 2001, the Tigers still finished with a losing record (4-7 and 5-6, respectively). The 2004 team went 8-4. Amid all the (rightful) joy over a “new era” of Tiger football, this good, clean start to the season may be the freshest element. Come mid-October, football teams are beaten up. As temperatures drop, fatigue peaks. But give a team something to play for, make Halloween the start of a stretch drive — not just for bowl eligibility, but for a premium bowl — and greatness often emerges. Justin Fuente and his coaching staff will find motivation easier with every win they put in the book. • This week’s tilt with Houston could be the first of seven straight games in which the Tigers are favorites. (Read that again.) The combined record of the Tigers’ remaining foes is 10-23. After being picked to finish third in the American Athletic Conference, the Cougars opened their season with a loss to Texas-San Antonio and have but two wins (over Grambling and UNLV). Houston has a defense that will resist more than that of Cincinnati, though, one that ranks second in the American, allowing 313.6 yards per game. (The Tiger offense averages 441.6.) For the first time in several meetings between these programs, Memphis may actually have the quarterback advantage. Lynch has thrown for 1,158 yards, completing 62.3 percent of his passes for seven touchdowns and only three interceptions. The figures for Houston’s John O’Korn: 944, 51.7, 6, and 8. Reports have indicated the Cougars may go with Greg Ward Jr., more of a dual threat than O’Korn. Keep your eye on my two favorite stats of the season so far. The Tigers are plus-7 in turnover margin, having gained 12 and lost five (second in the league). And Memphis has been remarkably efficient when given a chance to score. On 24 trips into the opponent’s red zone, the Tigers have scored 22 times . . . 17 of those touchdowns. Protect the ball. Score when you can. Simple game, right? • There’s one (and only one) silver lining to the news that the Tigers’ sophomore tailback, Doroland Dorceus, has been lost for the season with a right-knee injury. When was the last time an injury to a second-string player in this program felt so damaging? Dorceus will be missed, and he’ll be missed because he provided the kind of depth that made him all but interchangeable with first-string tailback Brandon Hayes. Leading the Tigers with 237 rushing yards over four games, Dorceus was second-string only according to the depth chart. Play calling was not impacted with Dorceus on the field (beyond the priority of getting him the ball). Production didn’t drop with Dorceus on the field. And Hayes was a better player late in games because of the relief Dorceus provided. That all changes with Dorceus removed from the Tiger ground attack. Freshman Jarvis Cooper has teased with his early-season performance (even at Ole Miss last weekend). And Hayes is accustomed to shouldering a workload. Losing Dorceus isn’t a death knell for the Memphis offense. But the grind of the conference schedule just got that much . . . grindier. • The Tigers finished September right where they wanted to be: 2-2. A win at UCLA or Ole Miss would have been a celebrated bonus, but Memphis wanted (needed!) to enter its conference schedule with a .500 record. This Saturday the Tigers face a real measuring stick for growth of the program. The Cincinnati Bearcats were picked to win the American Athletic Conference, and even after being dusted by Ohio State last weekend, Tommy Tuberville’s squad seems to have the kind of offensive attack that can win games by halftime. Quarterback Gunner Kiel — a Notre Dame transfer — leads the American in passing efficiency, having thrown for 1,041 yards and 14 touchdowns (two interceptions) in three games. Wideout Chris Moore caught three of Kiel’s passes against the Buckeyes, all for touchdowns that totaled 221 yards, earning Moore the American’s Offensive Player of the Week award despite his team’s lopsided loss. 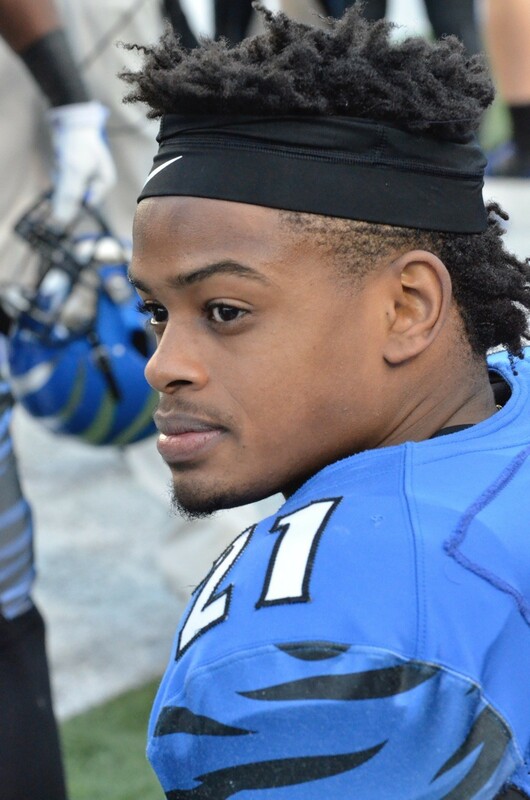 The idea of Memphis cornerback Bobby McCain battling Moore downfield is a scintillating angle to the Tigers’ first conference test. Cincinnati gave up a whopping 710 yards (on 101 plays) to the Buckeyes. Memphis may get the chance to win a shootout in the stadium where Justin Fuente’s old friend, Andy Dalton, now plays on Sundays. • The Larry Porter years weren’t all bad. Ron Leary and Dontari Poe were teammates in 2010 and 2011, each suffering 21 losses in 24 games. Last weekend, Leary and Poe played important roles in the Dallas Cowboys and Kansas City Chiefs, respectively, winning big games in Week 4 of the NFL season. Starting at left guard for Dallas, Leary has been part of three straight wins for the Cowboys and helped tailback DeMarco Murray take over the NFL’s rushing lead with 534 yards. And coming off a Pro Bowl season, Poe has established himself as one of the two or three best nose tackles in the NFL. (The Chiefs are 2-2 after steamrolling New England Monday night.) Both Leary and Poe were recruited by Tommy West. They’re reminders that, even in the darkest of days, a college football program can yield a little light. • There are four FBS programs in the state of Tennessee and, for too long now, the Memphis Tigers have been the cellar dweller in this mythic division of college football. Tennessee has been off the schedule, mercifully, since 2010. The U of M hasn’t played Vanderbilt since 1989 (the Commodores have won seven of 12 meetings). Since resuming a series with Middle Tennessee in 2007, the Tigers have lost five of six games, including two (2007 and 2012) at the Liberty Bowl. The Tigers can recalibrate the Volunteer State pecking order this Saturday. It really should have been recalibrated last year in Murfreesboro. Memphis outgained the Blue Raiders, 350 yards to 284. The Tiger defense throttled Middle’s running game, yielding an average of 2.1 yards per carry. Brandon Hayes and Marquis Warford combined for 139 yards on 21 carries. But the Tigers had to settle for two short field goals (one in the second quarter, another in the third), the difference in a 17-15 loss. Oh, and the penalties. Memphis was flagged 15 times for 145 yards (the yardage figure is the second-most in Tiger history). If the Tiger offense resembles anything like the one that battled UCLA for four quarters, Saturday should be a different story. 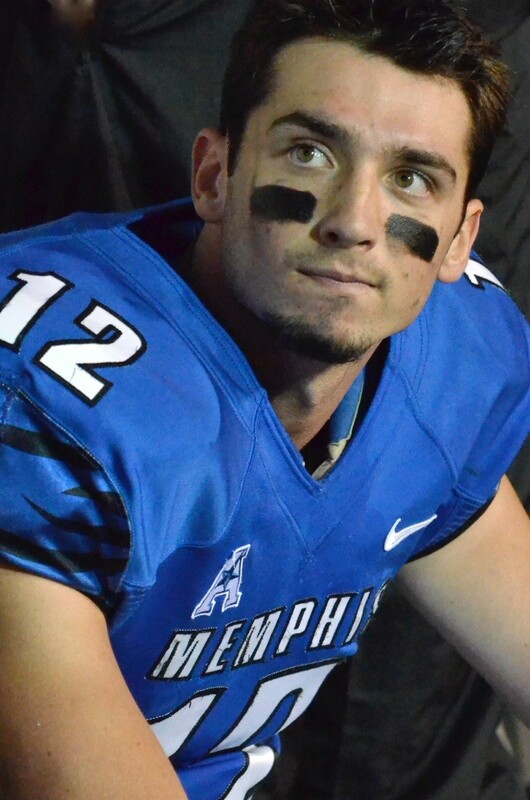 Paxton Lynch is a different quarterback from the one starting his second college game in Murfreesboro. Motivation should be a factor in the U of M’s favor. (Remember, too, that Middle Tennessee is now a member of Conference USA, the league Memphis left behind.) Unless the Tigers again run into a flag-happy officiating crew, a win Saturday will be there for the taking. • The Tigers have a reasonable chance to finish September with a .500 record for the first time since starting the 2004 season 3-1. (In 2005, Memphis beat UTEP on October 1st to even its record at 2-2.) With 10th-ranked Ole Miss looming (September 27th), the Tigers need to secure a win at home this Saturday. In tennis terms, Memphis must hold serve through the rigorous first half of its schedule. If the Tigers can beat Middle this week, then split the two games in early October (at Cincinnati and home against Houston), the Tigers can enter a much softer second half of the season with a 3-3 record. And if you glance at the American Athletic Conference standings today, the six teams Memphis will face after the Houston game — SMU, Tulsa, Temple, Tulane, USF, and UConn — have combined for a record of 5-11. Four wins in the second half would be a reasonable forecast today, making bowl eligibility a certainty with as few as two wins in the U of M’s first six games. • It’s hard to measure the performance of an offensive line with numbers. But there are two that stand out for Memphis in its performance at UCLA on September 6th. Facing as large and quick a front seven as it will all season, the Tiger offensive line helped Memphis gain 164 yards rushing on 39 carries (4.2 yards per carry) and allowed but a single sack of quarterback Paxton Lynch. 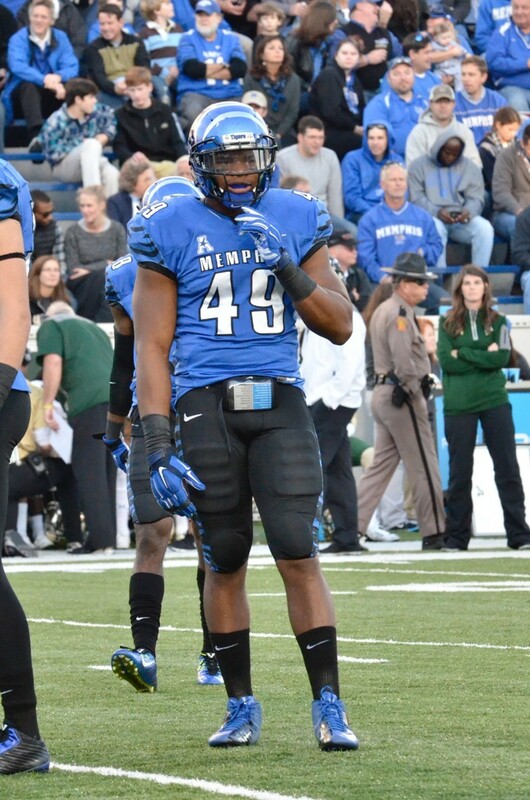 (Over the course of the 2013 season, Memphis averaged 3.8 yards on the ground.) And consider the Tiger rushing attack in the Rose Bowl was supplementary to the U of M passing game (305 yards). The Tigers will win games here or there with skill-position stars. They’ll win consistently and regularly when they can win the push at the line of scrimmage. So keep your eyes on the big guys with the high jersey numbers: Taylor Fallin, Tyler Uselton, Gabe Kuhn, Michael Stannard, and Al Bond were the starters (left to right) against the Bruins.